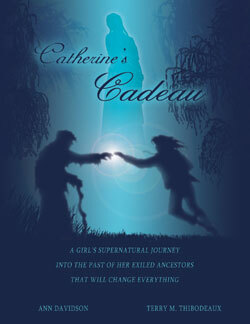 Terry Thibodeaux's novel Catherine's Cadeau tells how the Cajun people came to be in Louisiana through the eyes of the fictional Monique LeBlanc. The book's artwork was created by his son, Mark, an SHSU alumnus and graphic designer. In 1755, the British government overtook the Nova Scotia area of Canada and devised a plan with the governor of Massachusetts to exile its French residents. Many of these exiled residents, the Acadians, settled in Louisiana, where they developed a unique culture known as Cajun. It is their harrowing story that Terry Thibodeaux, associate dean and professor of communication studies, relives through the eyes of the fictitious Monique LeBlanc in the novel Catherine’s Cadeau. Co-authored by Ann Davidson and published this year by SHSU’s Texas Review Press, the story details LeBlanc’s journey back in time to experience the “horrific” treatment of the Acadians as they were forced from their homes and shipped to America. While visiting a historic site in Nova Scotia, a place her dead mother had always wanted to take her, LeBlanc encounters a creepy old man who just happens to know her name. “When he shakes her hand to leave, she is immediately transported back to the year 1755, which is when our ancestors were exiled,” Thibodeaux said. “She lets go of his hand, and she’s immediately back in the park. It scares the heck out of her. As strange as the premise is the fact that the two co-authors have never met in person. A Cajun descendent and scholar of the culture for more than 20 years, Thibodeaux met Davidson, a Massachusetts native, through a ListServe ad at the recommendation of a friend, who happened to see that Davidson was looking for someone knowledgeable on the topic for a book she was writing. Because he likes science fiction, and time travel in particular, Thibodeaux contacted her, and they began their collaboration via e-mail and a few phone calls. Thibodeaux’s son, Mark, an SHSU alumnus who is a graphic designer, did the cover art for the book, as well as some sketches inside. Thibodeaux said because the novel’s historical aspects are true, the novel will give readers s glimpse into the “horrific” treatment of the Acadian people during their expulsion, as lived by his ancestors as well as around 11,000 others. The Acadians had their guns and boats taken from them, were ripped out of their homes and imprisoned until they were put into boats, “sometimes for weeks at a time before they even set sail” and were not told where they were being taken, according to Thibodeaux. Thibodeaux said that through the years, he has done research and papers on the Cajun culture to help preserve it, the knowledge of what it is and where it came from, which is one of the biggest reasons he became involved with the novel. “It’s an untold story; I think it’s a good story that people will find interesting, but it’s also a chance to tell a part of American history that we don’t see in our history books,” he said. “Even though it generally doesn’t make it into any of our American history books, it’s just as much American history as it is Canadian history. “It’s not an academic publication, but I think it hopefully will have a beneficial effect on our culture in terms of helping us to understand where were came from and maybe help to preserve what we are as Cajuns and realize that we are from the Acadian people and that’s really something to be proud of,” he said. Currently being printed, Catherine’s Cadeau is available for preorder online through the Texas Review Press, the Texas A&M Press Consortium or Amazon.com. Thibodeaux and Davidson have also already begun a follow-up to the novel.